Many patients wish to attain straighter smiles. At Ontario River Arch Dental, Dr. Dinh straightens smiles with Invisalign® clear aligners. This innovative treatment plan is perfect for patients on-the-go, who do not want to compromise their aesthetics with traditional metal braces. 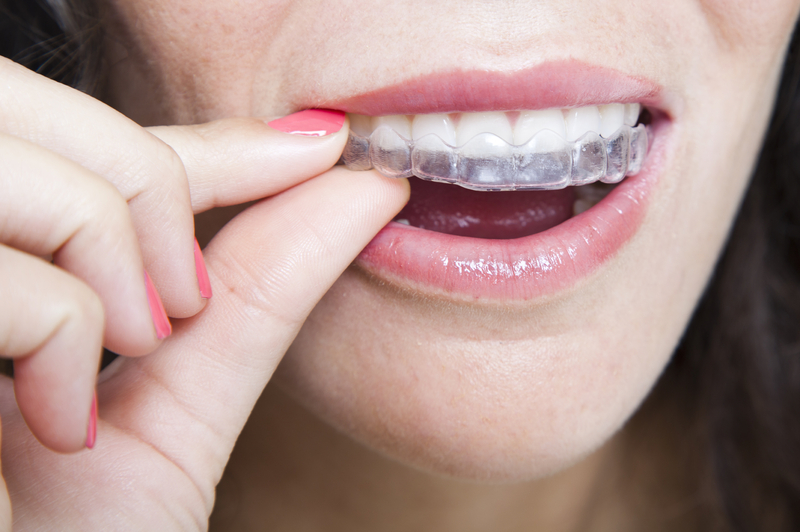 Invisalign® provides an inconspicuous option to achieve the smile you deserve. Ready for a brand new smile? Contact our dental practice today for your Invisalign® consultation! Unlike traditional braces that are bonded to teeth, Invisalign offers an orthodontic option that is removable. Patients do not need to add to their at-home oral care routine; simply remove the aligners before you brush and floss your teeth. With no interference in day-to-day activities, patients can enjoy all their favorite foods without the concern of damaging their orthodontic appliances. Take your clear aligners out before you eat and drink. We even recommend patients rinse and brush after eating to ensure no debris is trapped between the trays. Fabricated out of discreet, durable materials, Invisalign clear aligning trays are customized to form to your smile. Utilizing a method similar to traditional orthodontics, Invisalign gradually and straightens your smile with ease. Dr. Dinh discreetly treats overcrowding, gaps between teeth, or complex bite issues with Invisalign. These removable, clear aligners easily accommodate everyday life and major events. However, clear braces must be worn for 20-22 hours a day for optimal results. For your Invisalign orthodontics consultation, Dr. Dinh creates a custom plan utilizing patented technology to straighten your smile. We take in-depth photos of your smile and send them to Invisalign, who sends back your completed treatment plan as well as a projected view of your future results. Our Ontario Invisalign dentist will go over the treatment with you and, once approved, orders your aligners. We provide sets of aligners every two weeks, allowing you full control of your treatment plan. We invite you back about every six weeks to monitor your progress. Once you’ve completed treatment with your last aligning tray, we ensure retention of your results by providing clear retainers. At Ontario River Arch Dental, we are dedicated to providing the treatment you need to achieve your ideal smile. Dr. Dinh offers Invisalign clear aligners for patients looking for a convenient way to straighten their smiles. For more information about Invisalign, or to schedule a consultation, contact our dental practice today.